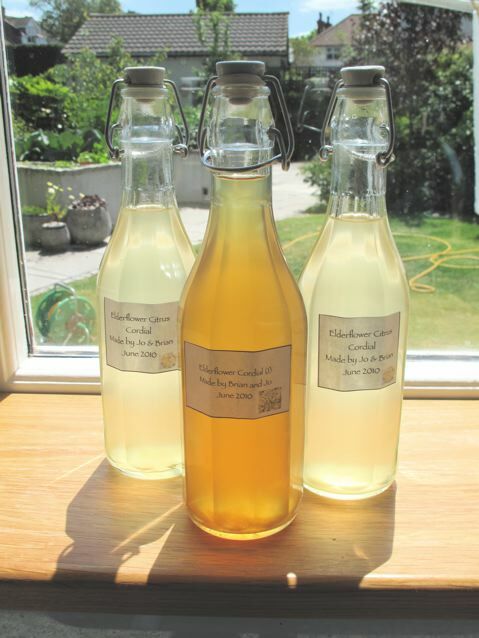 On the kitchen window is the second lot of cordial, made differently from the first. Time will tell if they fizz, bubble, explode…. how exciting ! 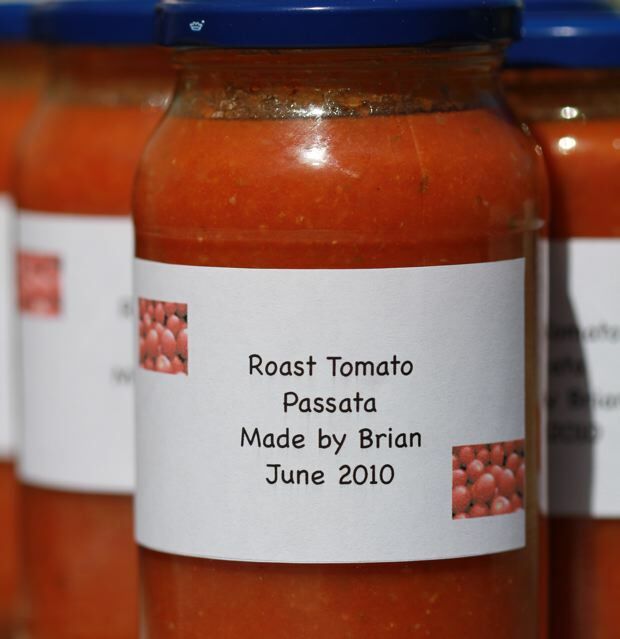 Jars of this and more tomato things are looking for a home on the shelves of the garage following Brian’s purchase of 12 kg of tomatoes the other week. 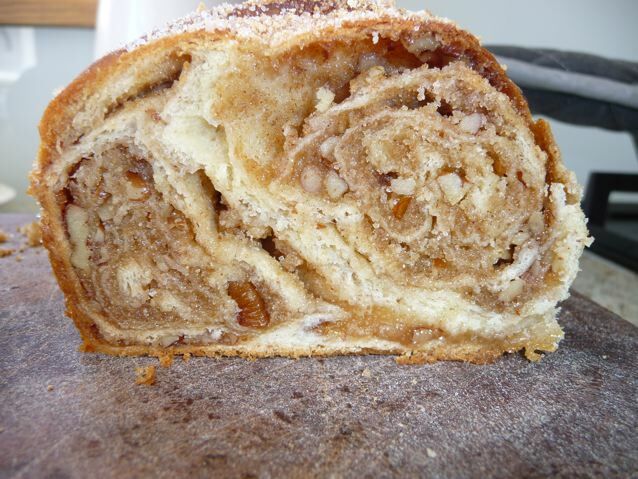 One bit of test baking that sort of worked. But I can’t give you the recipe…. The lime trees are flowering…. 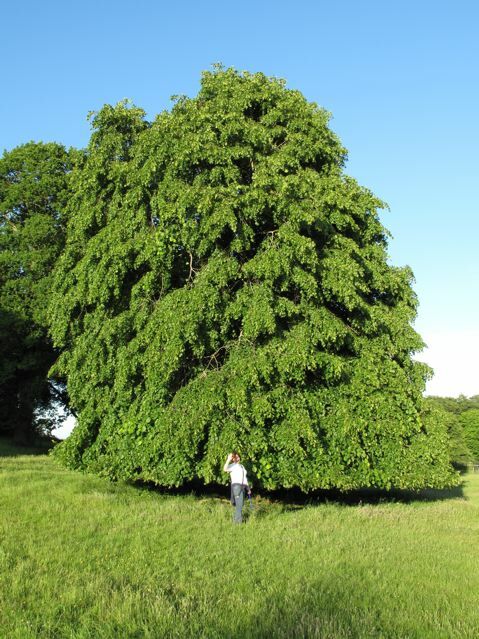 I am going to harvest some of the flowers and make my own linden blossom tea this autumn. Lime trees, beloved of town planners for their sticky sap which stops people parking under them, and a great and glorious tree when left unpollarded like this one at Ashton Court. 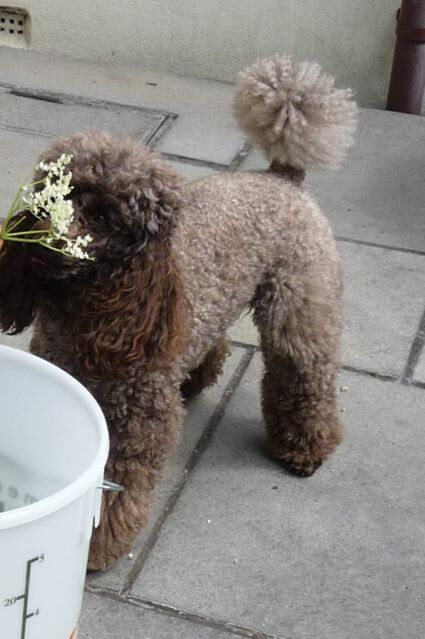 This entry was posted in Dog Walks, Garden, Plants and Trees, Wild Food and tagged corylus purpurea, elderflower cordial on 25/06/2010 by Joanna. The following day we studied the instructions again. One thing I forgot to say; you need a thermometer. If you are going to do any of these recipes, it is essential. That and this book and you won’t go too wrong! 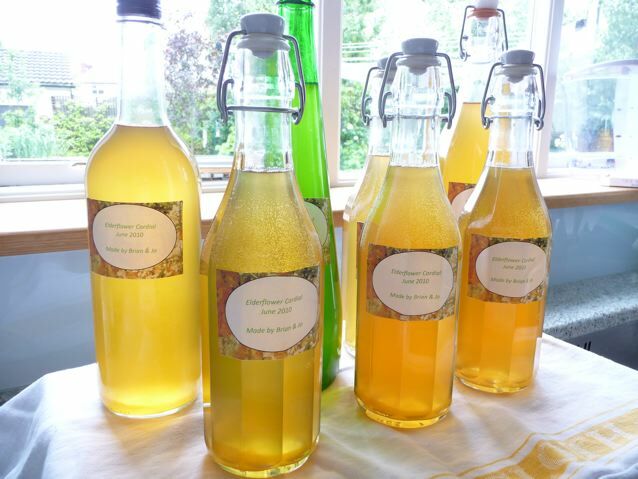 Pam Corbin’s method gives a cordial that you can keep on the shelf. 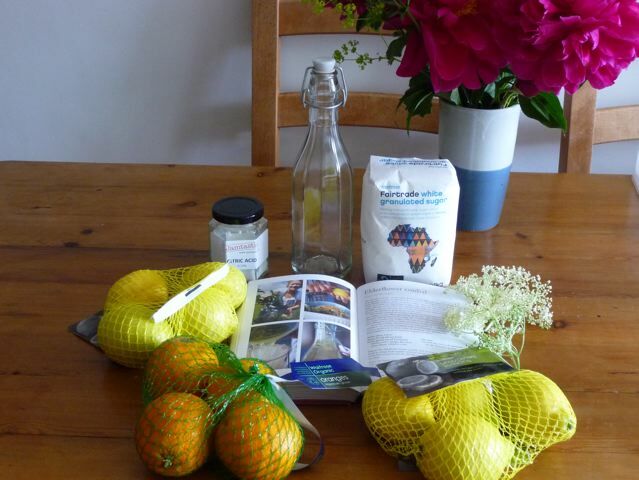 Other methods give a result which you have to keep in the fridge, like the Jam Jar Shop Guide to Elderflower Cordial. 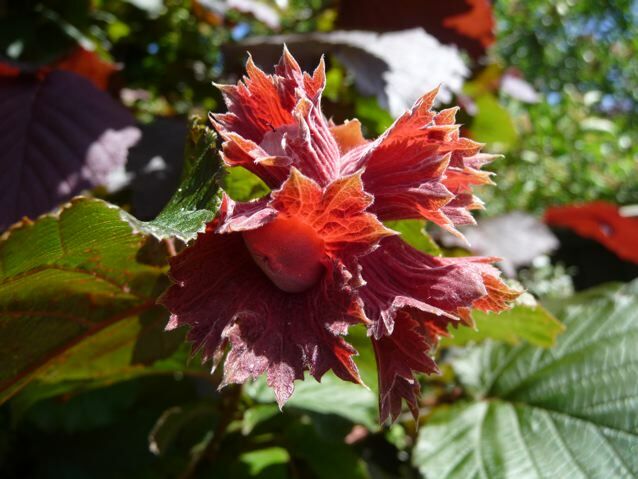 The alternatives have some version of making a sugar syrup first, then adding the flowers. 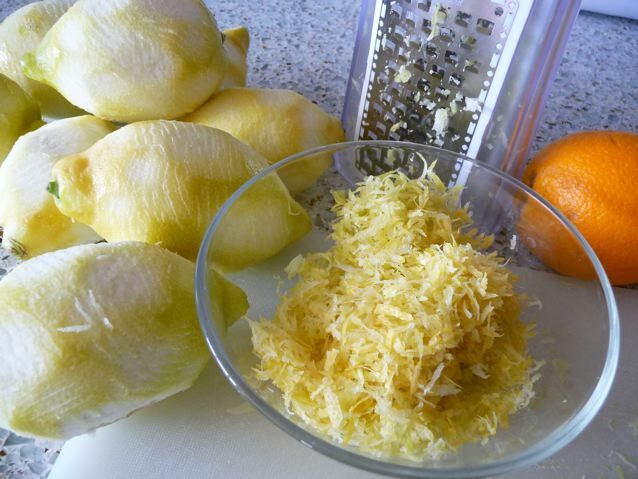 Some recipes add chopped up whole citrus fruit rather than zest. That method presumably is gentler on the flowers and you might get a more fragrant though shorter lived cordial that way. 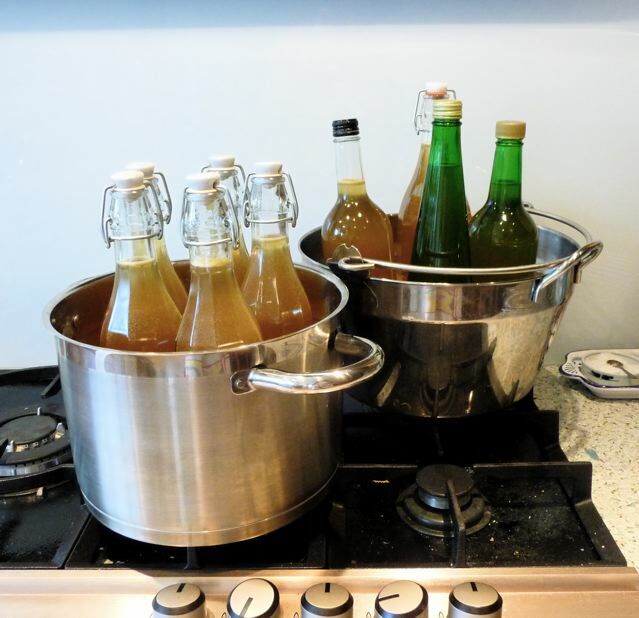 There is a risk of mould if you don’t use a sterilising water bath to process the bottles and want to keep the cordial out of the fridge in storage. 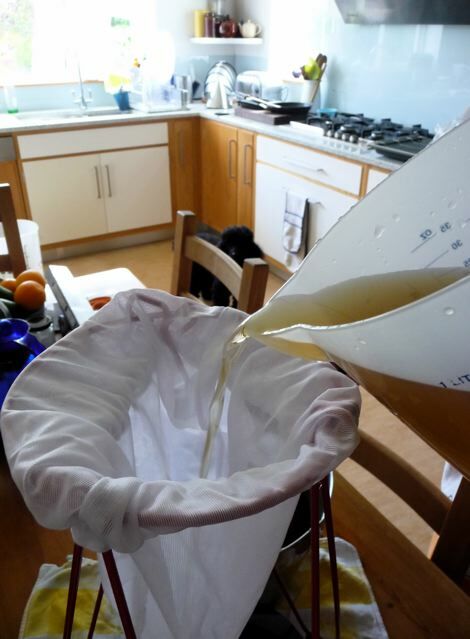 Filtration: Brian poured the liquor carefully out of the bucket where the flower heads and zest had been soaking overnight into another container and strained it through a muslin bag to remove particles. 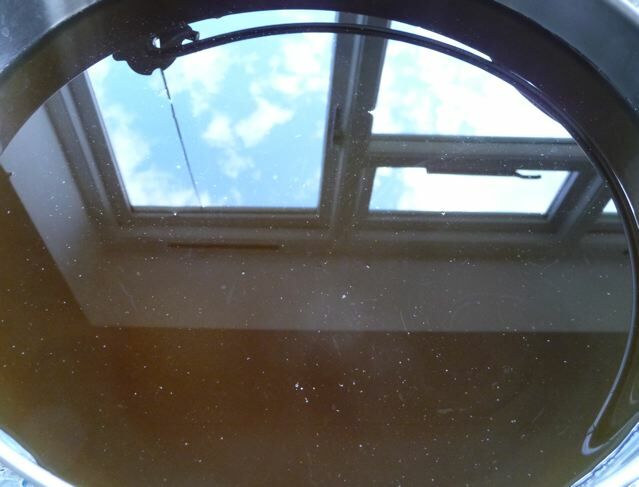 The liquid was very dark and we worried that we were gong to end up with a brown cordial. Then we did some sums; 1.5 litres of liquid to 1 kg of granulated sugar plus one heaped teaspoon of citric acid were the proportions used. 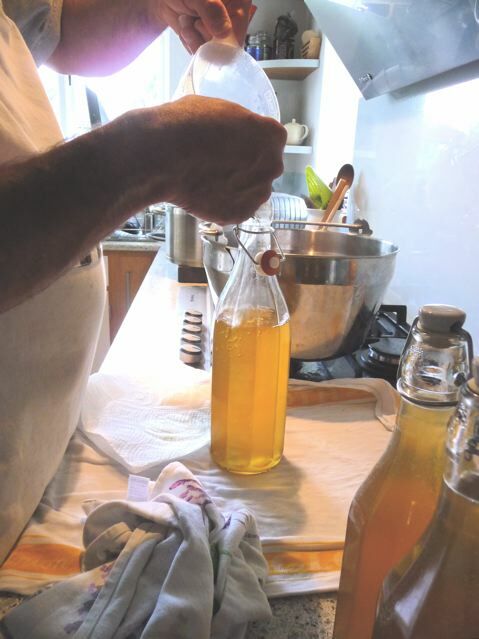 We added all of the lemon and orange juices reserved from the previous day, about 500 ml, to the strained liquor, sugar and citric acid. Heated it up slowly to dissolve the sugar and then realised that we had forgotten to strain the citrus juice, so we put the whole lot through muslin again. Twice. A mistake that could be fixed! No floaty particles now! Our jam pan held 4.5 litres worth of liquid so that’s what we worked with. We sterilized the bottles and Brian carefully simmered the cordial. It stayed a murky brown. I took a spoonful and put it in a glass and diluted it to see what it tasted of. Not quite right somehow, but I couldn’t work out why. A little bitter, a little polleny, not what I expected. I went away to do something and when I came back Brian had transformed the cordial. 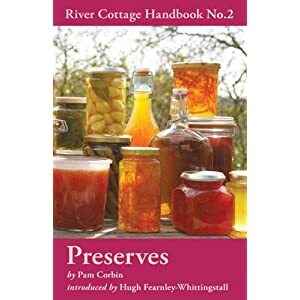 The secret was buried in Pam’s notes: it has to come up to 88° – 90° C whilst being simmered, for two minutes, this not only extends the shelf life but transformed the cordial into a paler and brighter fluid. Now it tasted right, silky, floral and citrussy. For a moment there I thought we were going to have to chuck the lot! Much happier now, Brian proceeded to fill the bottles leaving a gap of an inch at the top for expansion in the final stage. He then arranged them in two waterbaths, positioning the bottles so they didn’t touch the sides of the pan and standing them on folded tea towels. Tops on bottles not done up tight at this point. The water was brought up to 88° C and kept there for 20 minutes. A thermometer is essential! After this, he hoiked them out and tightened the tops. Bottles of golden June delight! I found some ancient sheets of label paper and used one of the photos as a background image for these labels. Thank you Pam and thank you Brian, chief bottler and preserver! 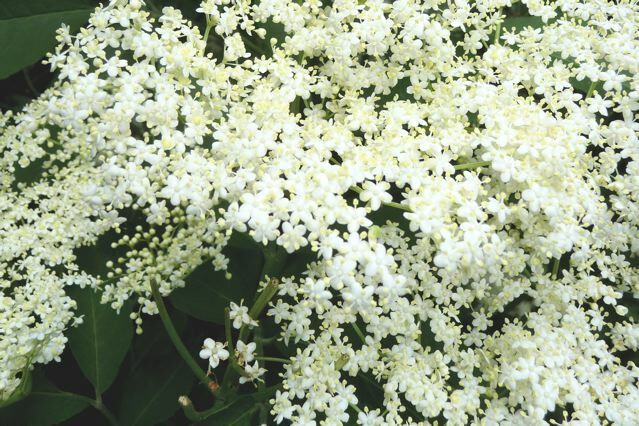 A summer of delightful elderflower spritzers beckons…. Edit: Later in the month when we were “Around and About” we made a second batch using a cold steep method. 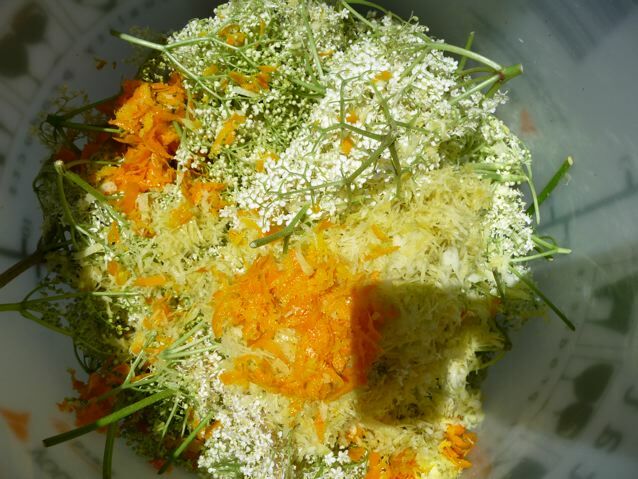 This batch was a lot more lemony and had less of the elderflower aroma too it, but had a much paler colour. 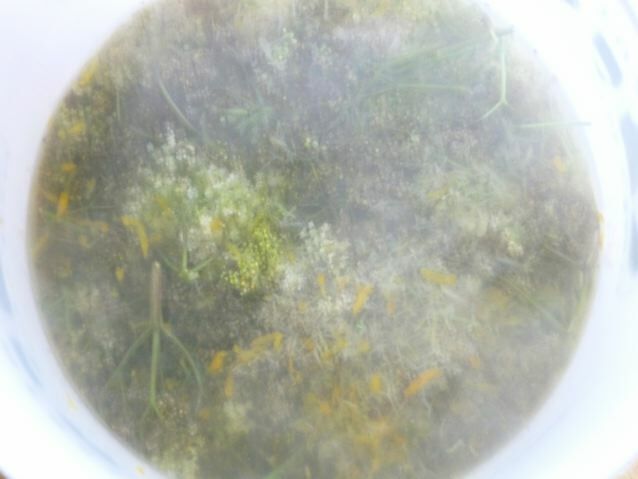 This entry was posted in Dog Walks, Plants and Trees, Preserves and Cordials, Recipes, Wild Food and tagged citric acid, elderflower cordial, jamjarshop.com, Pam Corbin, preserves on 14/06/2010 by Joanna.